Nearly two years ago, Los Angeles Times columnist Steve Lopez posed a question in an op-ed worth revisiting. Based on a recent speech given by Alex Caputo-Pearl, the head of United Teachers Los Angeles, the answer is a definitive yes. The juvenile world of heroes and villains Caputo-Pearl described, one where evil corporations and billionaires look to profit from public education while scrappy, earnest underdogs try to stop them, bears no semblance to reality. Teachers unions in California comprise one of the most powerful political forces in the state. What is glaring in Caputo-Pearl’s speech is that aside from mentioning his own two children, the word “children” was said only once. This speaks volumes as to the rationale behind his leadership, a role serving the interests of adults before those of students. Threatening to strike should be an absolute last resort, not the first order of action. It calls to mind a classic paradox. The unstoppable force is the rising cost of health care and pensions in this nation. 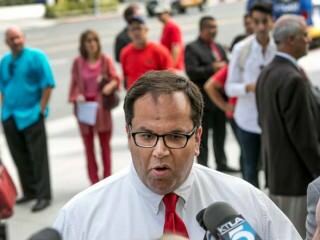 As a result of these sharply increasing costs, LAUSD faces a staggering amount of debt, to the tune of more than $11 billion, that threatens to cripple the entire system because the district is on the hook, per demands made by UTLA, to provide lifetime health benefits and retirement pensions to its employees. According to a report written by an independent financial review panel that was commissioned by LAUSD, the district owes more than $20,000 per student for unfunded liabilities (see page 44) although per pupil expenditure in California is less than $10,000 per student. Placed in further context, the liability for retirement benefits LAUSD is obligated to pay for is four times that of other large urban school districts. Twenty-seven percent of state funding LAUSD receives goes to paying pension and health care costs before factoring in teacher salaries, school supplies and textbooks. To fully fund health care benefits, LAUSD would have to pay $868 million every year for 30 years—and it is not alone. Seventy percent of school districts in California provide some variety of lifetime health benefits to retired employees. The pain will not be felt by Los Angeles alone. The immovable object is the UTLA, which Lopez wrote, “has shown little flexibility: not on salary negotiations, tenure, student testing, teacher evaluations or anything else.” The district is standing on the edge of a fiscal cliff, yet Caputo-Pearl ignored the findings of the report. • Enrollment at LAUSD schools has declined by 100,000 students, half of the loss is due to a dip in the birth rate and students transferring to other school districts. The other half has gone to charter schools, but the report’s authors take a neutral stance when it comes to charter schools. They advised the district to study why families decamped for these schools in the hopes of gathering insight. • Although enrollment has dropped dramatically, the number of full-time staff at LAUSD increased, which the report’s authors wrote merited rethinking. • Students in the district attend school less often than the statewide average resulting in daily losses of revenue. • Only 75 percent of LAUSD teachers have a strong attendance rate (defined as attending work at least 96 percent of the time), leading the district to spend $15 million it can ill afford to lose paying for substitute teachers. “It outpaced all other special interests, including corporate players such as telecommunications giant AT&T and the Chevron oil company, from 2000 through 2009, according to a state study. In that decade, the labor group shelled out more than $211 million in political contributions and lobbying expenses — roughly twice that of the next largest spender, the Service Employees International Union. We are not talking about some cash-strapped upstart, but a well-oiled political machine, a group that will fight tooth and nail to preserve its own interests even if it means bringing about financial ruin. Caputo-Pearl should not aim to create a state crisis, but to try to prevent one from happening. But when someone delivers a speech about education and the word “children” is barely uttered, holding such a hope is magical thinking. If UTLA doesn’t embrace some measure of compromise with the district, the immovable object will have nothing to meet it.